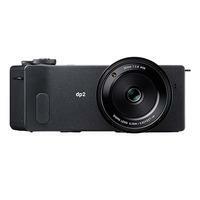 The Sigma DP2 Quattro Digital Camera presents a portable and powerful compact camera for the advanced shooter looking to capture exceptional images. The DP2 sits in the middle of the Sigma Quattro series with a fixed 30mm f2.8 lens and newly designed 39-megapixel APS-C sized Foveon X3 Quattro sensor. The Foveon image sensor is Sigma's proprietary technology which captures transmitted light in a vertical 3 layer sensor with dedicated layers to Red, Green and Blue. The only one of its kind, this unique sensor delivers detailed images with better colour gradation, improved processing speed, quicker autofocus performance and better high ISO capabilities than its Merrill predecessors.